Crush It!, while not being a one-fits-all, is a book that covers the secret of how to turn your passion into a business. Vaynerchuck states that anyone can do this. It is part autobiography and part business book. He answers all of his e-mails himself. It may take some time for a personal response as Vaynerchuck receives thousands of e-mails a month—while simultaneously running a business. Vaynerchuck offers his e-mail for anyone reading Crush It! who may wish to ask him a question. Not many authors of this type of book are willing to put themselves out there like that. It is refreshing to know that readers are not alone in figuring out how to use what they have read in this case. Crush It! cannot cover every single possibility or answer every question that might arise (the book would be enormous, and still might not cover every situation or passion), it does however, cover the basics of turning a passion into a moneymaking possibility. Will it happen overnight? No, Vaynerchuck says it is hard work, and one must be willing to do whatever it takes over the long haul to make it happen. It is about living happily with what a passion-turned-business can bring. Vaynerchuck says that family must come first. The idea is to make work something you enjoy doing, because if it is something that is enjoyable, people are more likely to put forth the effort required for success. If someone is lucky enough to be working at something that is a passion, is it actually work? It may not feel like it. 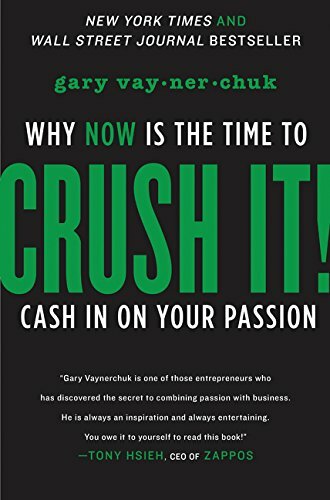 Vaynerchuck does not promise that individuals will become the next millionaires, only that a passion can make someone willing to do the hard work necessary to grow a moneymaking possibility into a money generating reality. Before turning a passion into a possible money moneymaking opportunity, one needs to be honest about what their passion is. If there is no passion in what the reader wants to spend time doing, will they work hard on it? Probably not. Crush It! is a no-holds-barred look at what it takes to turn a passion into a short commute to work, and feel better about what you spend your time doing. The money will come eventually. How much money is up to the individual and his or her willingness to do what is necessary to make it happen. Robert Medak is a writer and editor.